Corning Cable Systems basic installation kit for single-fiber and 2-fiber UniCam Connectors, terminates single-fiber ST compatible, SC, LC and FC, as well as 2-fiber UniCam MT-RJ Connectors. Includes FBC-001 Score and Snap cleaver. 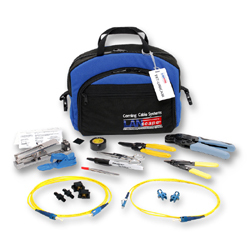 Corning Cable Systems UniCam Connector Installation Tool Kits are designed with the installer in mind. Conveniently packaged in an easy-to-carry ballistic nylon bag, the tool kits are compact and easy to carry around the job site. Contains a new high-performance cleaver and fiber handlers for superior cleave performance when terminating single- and 2-fiber UniCam Connectors. Recommended for single-mode installations, the tool kit reduces scrap and improves connector performance. The Continuity Test Set (CTS) versions of the UniCam Connector Tool Kit Family provide a visual feedback feature when terminating UniCam SC, LC, ST compatible or MT-RJ Connectors. Useful for reducing scrap rates or for training new installers, the TKT-UNICAM-CTS is very popular, since the installer can watch for the red glow in the back of the connector to dim or disappear. This indicates that the field fiber is inserted properly in the connector.